A vital part of taking up the craft of knitting is finding the right needles. Not using the best pair for the job will lead to many years of mistakes, and projects left in the knitting bag because you lost your enthusiasm. To help prevent this from happening here is a handy guide that will help you figure out which knitting needles for beginners are the best. 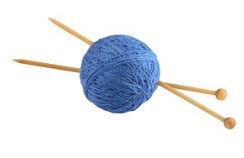 What are knitting needles made of? The traditional material for making knitting needles is aluminium. However, there are lots of other materials worth considering. Plastic – These are great for a beginner, as they are the least expensive. Should you decide that knitting isn’t for you, you won’t have wasted a huge amount of money. Wood – Far less slippery than metal needles, which is great when you’re a beginner. Far fewer lost stitches if you use needles made of wood. Bamboo is a popular choice, as they feel warm to the touch and are lightweight. Aluminium – These are the most traditional, and many of you will have fond memories of granny clicking away with her colorful, metal knitting needles. As well as wood, metal, and plastic needles, there are also steel, glass, resin, and carbon fiber needles. If you’re looking to choose knitting needles for a beginner we’d urge you to try lots of different ones if possible. That way you’ll learn about the feel of the different materials and pick one that’s most comfortable for you. Needles come in a range of different styles. We all know the long, straight type, but there are a few more. Straight needles – These can be used for anything that’s knit flat. However, we do have a word of warning. Using them on really heavy projects will take its toll on your wrists. Holding up needles that are heavy, for any length of time, is going to be a bit of a workout. Long circular needles might be a better option in this case. Straight needles are the most recognized tool for knitting projects. Quie simply, they are a straight slender stick, tapered to a point at one end. Hence, they are also known as single-point needles. There is a knob at the other end which serves to prevent stitches slipping off. Circular needles – These are used for knitting items that will be round such as a hat. They can also be used for sweaters. They are available in a wide range of lengths, and comprise two straight needles joined by a flexible plastic cord. The first patent for a circular needle was issued in 1918. In Europe they may have already been in use at that time. Double-pointed needles – These are best used for knitting tiny circles and tubes. Most often they are used for knitting hat crowns, but are also vital when knitting an I-cord. These are the oldest type of needle. Tapered at both ends means they can be used to knit from either end. Typically, they are used and sold in knitting needle sets of four or five, and are most often used for circular knitting. Since circular needles came on the market they are used mostly for tube-shaped items such as sleeves, socks, and collars. Knitting needles come in a range of different sizes, and depending on where you live, here’s a handy table to explain the differences. Walking down the knitting aisle of your local craft store can be overwhelming. So many sizes, types, colors, and materials to choose from. Where is the best place to start? Over the years you’ll probably build up quite a collection. but if you’re just starting out we’ll help by giving you some hints and tips on where to start. What yarn will you be using? Once you’ve decided on the yarn you’ll be using you’ll know exactly where to start. Take a look at the label, and simply read the recommendation. You’ll be told what size needle is best to use. What type of knitting needle? We’ve already mentioned the options, and it’s really down to you to decide. Bamboo needles are good to start off with because you’re far less likely to drop stitches. However, they can be rather expensive, which isn’t a great option if you’re not serious about your hobby. What length will your needles be? Most single-pointed needles are only available in 10” or 14”. The shorter of the two will much easier to handle if you’re just starting out. If you take up knitting seriously then you’ll gather quite a varied collection. So, don’t worry about buying all possible variations at once. We hope that our tips come in useful, for those of you about to buy your first set of knitting needles. It’s not going to be long before friends and family are looking forward to your projects.